Eleanor and Park – Challenged! Eleanor and Park is an ultimately hopeful Young Adult novel grounded in some harsh realities that probably won’t feel unfamiliar to many teen readers. The characters face bullying, domestic abuse, and racism. The book still manages to feel light and romantic in spite of the obstacles the characters are facing and illustrates that change is possible in spite of harsh circumstances. Still, even though the book won many accolades and awards, it has been the source of some controversy. 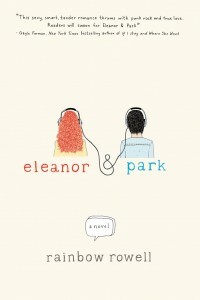 In 2013 Eleanor and Park was challenged by a parent action group in Minnesota who requested it to be removed from the school libraries after it was selected to be the part of the high school voluntary reading program. They cited 227 instances of profanity in the book as well as crude and sexually charged material that was inappropriate for students. The author has been slated to visit the area but according to a Omaha.com news article, Rowell’s appearance at the Anoka County Library was cancelled when the library pulled its invite. The Anoka-Hennepin school district declined to pick up the speaker’s fee the library had offered. The books themselves reportedly remain on the shelf. So what’s all the controversy about? Teen Book Club at Mesa County Libraries will be discussing Eleanor & Park this Wednesday September 30th in honor of Banned Books Week. Join us and share your perspective!